I hope you are having the same sunny spring days we do. Still chilly though. Some early spring flowers are already starting out. Irises are about 10 cm out of the ground though surrounded by snow patches. My tulip in the picture is from the florist, we'll have to wait for a while till we can see them blooming in the garden. Beautiful, strong colour contrast in this tulip! Love the touch of light glow in the petal on the left! That's a beautiful shade of orange with a touch of peach. One of my favorite spring flower! I just love their colours! 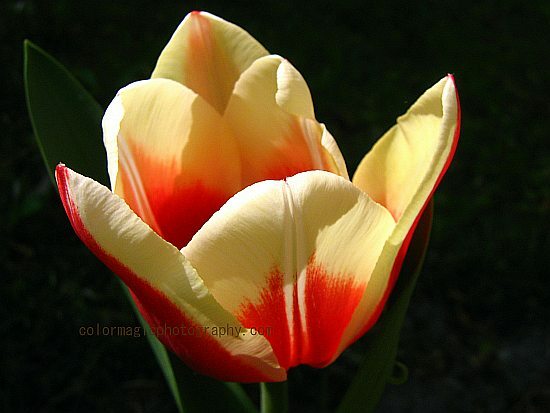 What an exquisite tulip photo. Not much sun here, but the pink trees are beginning anyway. We'll take it! It is always sunny in my country, Maia. Now it is hot at 34 degrees! But I am glad that you are having the spring season where the flowers are out to seduce you for macro shots! That is a beautiful tulip. I am so looking forward to seeing them in my garden again. Great macro shot of the tulip. Love the photo. Over the past couple of weeks, I've had to backlink to your post to link. I use your button but the code isn't the same as the link you're now asking us to use. Causes an error every time. Could you please delete my first post since it just sends everyone back here? You might want to fix your button so the code matches the new link. Thanks. I checked all my buttons and they are all working fine. If any of you are having problems linking up, please let me know in a comment. Lindíssima tulipa! Cores suaves, porém iluminadas! Amei!